This signed book collects tons of your favorite RAK SUPERFREEKS ! Order yours today!!! 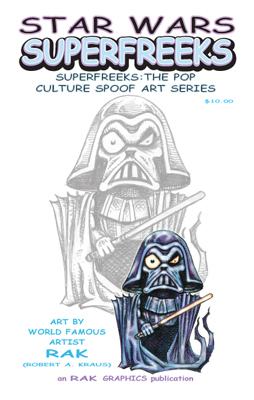 This book collects tons of your favorite RAK STAR WARS SUPERFREEKS!!! 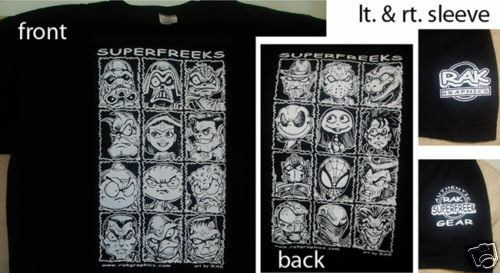 SUPERFREEK T-SHIRTS AVAILABLE NOW ADULT S-XXXLG!!!! "CHECK OUT THESE COOL T-SHIRTS WITH ARTWORK BY ME, RAK. 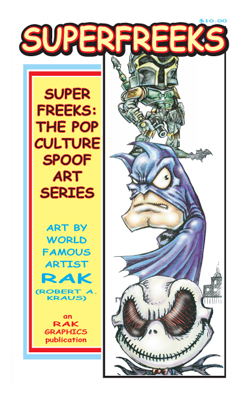 I AM THE ARTIST OF THE SUPERFREEK SERIES WHICH IS A FUN SPOOF ON POP CULTURE ICONS. MANY OF YOU HAVE PURCHASED MY SUPERFREEK CARDS, AND NOW YOU HAVE THE OPPORTUNITY TO WEAR YOUR FAVORITE SUPERFREEK ART...IT IS 100% COTTON , PRE-SHRUNK AND MADE OUT OF A NICE HEAVY MATERIAL- AVAILABLE IN ADULT SIZES S-XXXL, SO JUST LET ME KNOW WHAT YOU NEED!" THERE ARE 12 CHARACTERS ON FRONT AND 12 MORE ON THE BACK FOR A TOTAL OF 24 COOL COMIC BOOK, CARTOON, MONSTER AND HORROR MOVIE CHARACTERS. NOT ONE TO SKIMP ON QUALITY OR DETAILS, EVEN THE SLEEVES ARE IMPRINTED TO GIVE AN ADDED DASH OF CLASS TO THIS AWESOME TEE. THIS WILL BE YOUR FAVORITE T-SHIRT EVER, AND A GREAT WAY TO SCOOP UP COMPLIMENTS AND START CONVERSATIONS ! SUPERFREEK TOTE BAG AVAILABLE NOW!!!! At the beach or to carry swag at a comic convention, get this amesome heavy duty tote bag with great artwork by the RAKman!